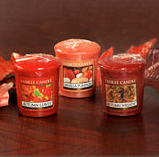 Use this coupon to get Yankee Candle Tarts and Votives for only $1 — 50% off the regular price! There is no limit to how many you can purchase with the coupon, so you only need to print one off. EDIT: RuthAnn is reporting that Bed, Bath & Beyond accepts Yankee Candle coupons. Combine the Yankee Candle coupon with BB&B’s 20% off or $5/$15 purchase coupons for a great deal. RE-EDIT: RuthAnn is now reporting that you can’t use a BB&B store coupon with the Yankee Candle coupon, but I’d give it another try. May be cashier specific. Shouldn't they take it since one coupon is a store coupon and the other is a manufacturer coupon? However, they have a sale this week (in their flyer) buy 15 votives, get 3 free… so 18 for $15 gets you some good smelling stocking stuffers for $.83 each! Yes. Bed,Bath,&Beyond do accept Yankee coupons at their store, at least in Grsham~! where does one use this coupon, esp in gresham?? Can Bed, Bath, and Beyond be an option? ?